For each residential unit within 1/4 mile of the BART station (i.e. 5-minute walk), Fremont’s zoning code requires 1.5 parking spaces . Beyond the 1/4-mile threshold, the requirement increases to 2 parking spaces. These parking requirements apply even to the affordable housing. Here is a presentation by Mobileye Co-Founder, Chairman & CTO Prof. Amnon Shashua. Mobileye is one of the technologies used for Tesla’s autopilot feature. Historically, the field of computer vision went through many decades with little to no progress. So to see such impressive results in a very short amount of time is completely mind boggling. 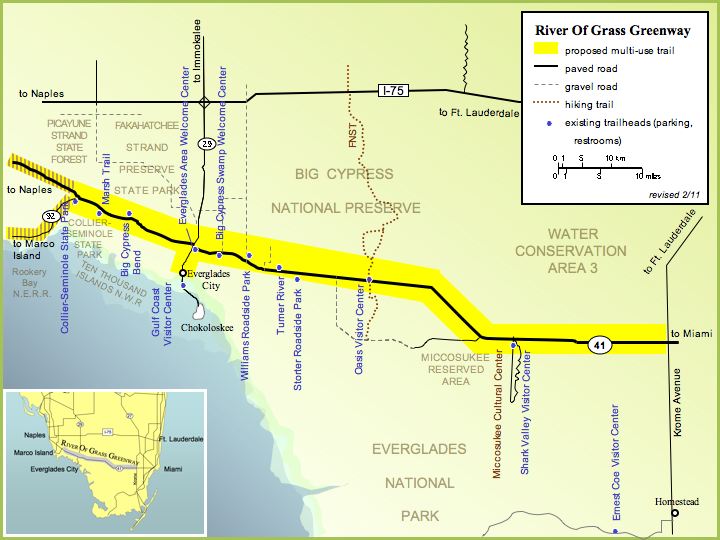 A proposed 76-mile bike path through the Everglades is currently under study. It would provide a safe alternative to highway 41 for bicyclists and pedestrians who wish to visit the park. That is why groups such as Adventure Cycling and Rails-to-Trails Conservancy are in support. Miami-Dade County, the lead agency for the initial planning, expects to complete a feasibility study and master plan by November or December, said Mark Heinicke, project manager for the county’s parks and recreation department. The plan will identify possible routes, access points, environmental issues, public benefits and public interest in the project. He is currently going through 485 letters and emails filed as comments on the project. Among them is a letter in opposition organized by the Sierra Club and signed by representatives of a wide variety of organizations that often find themselves on the opposite sides of environmental debates. Among the dozens of signers are representatives of hunting groups such as the Everglades Coordinating Council, Safari Club International, United Waterfowlers of Florida, the Collier Sportsmen and Conservation Club and the Florida Sportsmen’s Conservation Association. The proposed alignment runs largely along the highway ROW. But the Sierra Club doesn’t care about the cars blasting through — just the bicycles and joggers.